Formerly part of a much larger estate belonging to Baron de Montesquieu, Ch. 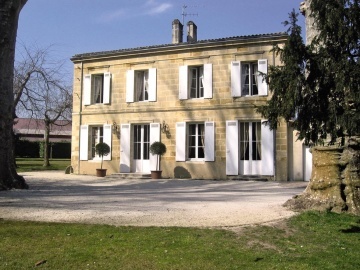 Haut Vigneau is now the property of Eric Perrin (one of owners of Ch. Carbonnieux) and the immediate neighbor of Ch. Carbonnieux. The terroir at Ch. Haut Vigneau is quite similar to that of Ch. Carbonnieux so the property is planted to 60% Cabernet Sauvignon and 40% Merlot and in most (so called “normal”) years, the blend is the same. If you are looking for a balanced, table-friendly but still fruit-oriented Pessac Leognan red (You are, aren’t you?) at a value price, look no further. A blend of 60% Cabernet Sauvigon and 40% Merlot fermented in temperature controlled stainles steel tanks with pump-overs and aged 12 months in all French oak barrels (15% new). Red-purple color with well formed legs; dry, medium-bodied with freshly balanced acidity and medium phenolics. Spicy fresh, lively, supple. Delicious. Red fruit and dusty gravel mineral with some tobacco and spice. Elegant balance and feel. A delight in the mouth. YUM. I love the balance and elegance of fine Pessac Leognan red and this wine is no exception to that expectation. Perfect at the table. BearScore: 92.